Peter Pupping has been a teacher and performer for most of his life. 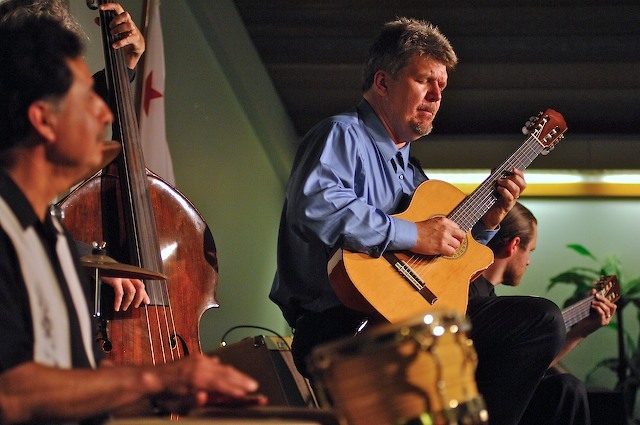 He helped develop the Mira Costa College guitar program for 12 years. He has enjoyed a successful performance, recording and teaching career and is very active from his base in Encinitas, CA. 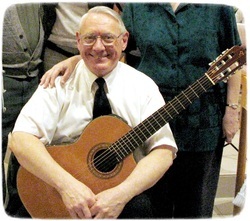 Peter is the director and founder of the Encinitas Guitar Orchestra which is now starting its 14th season. Peter describes his music as very eclectic and centered around instrumental guitar. He has studied and taught classical, jazz, world music, rock and pop and has recorded music in all of these genres. 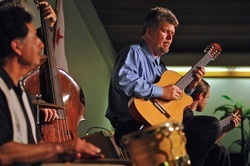 Bachelor's and Master's of Music degrees earned from San Diego State University where he studied with Robert Wetzel, Brian Kilmer and Celin Romero of the internationally known Los Romero's Guitar Quartet. Additionally, Peter participated in master classes with Pepe Romero, Christopher Parkening and Scott Tennant. His traditional classical guitar focus was broadened through jazz studies with saxophonist Charles McPhearson, bassist Gunner Biggs and pianists Art Resnick, Ivar Antonsen, guitarists Andy Riley, Peter Sprague and Bill Coleman. The idea of a guitar orchestra came to me after having played in one at San Diego State University. I soon realized that the tradition of plucked instruments and their players getting together to form orchestras has a long history. Consider the mandolin orchestras of Vivaldi, Balalaika orchestras of Russia and now guitar orchestras throughout the world. A guitar orchestra includes sections divided up into 4 to 8 parts with multiple players on each part. While exploring a wide variety of music including classical, jazz and world music styles a guitar orchestra can also include other instruments such as percussion, bass, strings, winds, specialty guitars and more. The sound (timbre, tone) of 25 or more guitarists can be likened to a giant harp. It is our hope that you'll be inspired to join us or come hear a live performance someday. Whether performing with us or experiencing one of our concerts you will capture a heightened sense of the beauty and camaraderie of musicians sharing music together as in days of old. Keith Van Zandt joined and has volunteered as an arranger and assistant conductor for the Encinitas Guitar Orchestra since 2006. ​Keith has been a teacher in the public schools and private corporations for over 30 years. He has taught all age groups from 2nd grade to adults. He was a music teacher at Crescent Junior High School for 14 years. He taught music theory and band at both Saddleback College and Orange Coast College in Orange County, California. In 1965 he earned a BA in Music from California State University Long Beach and in 1970 an MA in Music from California State University Fullerton. When he was 45 he became interested in the Classical Guitar and studied with Frederick Noad at the University of California, Irvine.